Here’s the latest addition to the PowerShot G range from Canon to be available from November 2017. 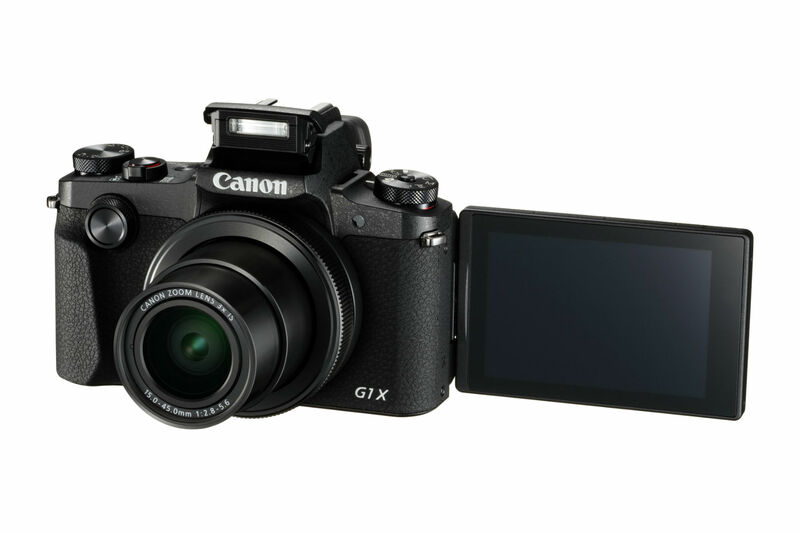 Canon announces the latest addition to its PowerShot G range, the flagship PowerShot G1 X Mark III. Replacing the G1 X Mark II, it’s a killer combination of Canon’s EOS DSLR image quality with the handling and compact size of a PowerShot. With a new, precision, 3x optical lens, an APS-C sensor and Canon’s premium DIGIC 7 processor, this camera is versatile enough to be used for high-quality street photography, all the way up to documentary-style storytelling. Perfect for today’s enthusiast photographer seeking DSLR quality in a compact form, this camera’s small size makes it ideal for subtly capturing boundless moments whilst on the move. Leveraging an exceptional sensor, similar to the one seen in the EOS 80D, and with capabilities to shoot in an ISO range of 100 to 25,600, it can flexibly capture quality images in a range of conditions. From high contrast scenes, such as indoor environments where detail, clarity and low image noise are critical, to low contrast scenarios, such as a foggy day, the PowerShot G1 X Mark III can always deliver a superb image. The DIGIC 7 processor provides premium image quality straight from the camera, with a reduced need to edit thanks to Auto Lighting Optimiser and Diffraction Correction, which featured in the EOS-1D X Mark II. Whether you’re shooting portraits or macro close-ups, the built-in 3x zoom lens boasts a versatile 24 – 72 mm (35 mm equiv.) focal range and a close-focusing distance of just 10 cm, so you can cover an impressive range of photography genres with a single lens. A shallow depth of field is created via the APS-C sensor combined with a large f/2.8 – 5.6 aperture. The PowerShot G1 X Mark III’s lens has been meticulously designed for the sensor in the camera and as such, can reduce potentially unwanted image artefacts that can ruin shots, such as glare. The lens’ 9-bladed aperture can also render pleasing background blur and circular ‘bokeh’, minimising busy backgrounds and adding impact to your subject. For the more adventurous photographer, the PowerShot G1 X Mark III features weather sealing for durable performance in challenging conditions[i] and as an increased level of protection against dust and moisture. It is Canon’s only digital camera with an APS-C sensor that can be twinned with an optional waterproof casing[ii], to enable the PowerShot G1 X Mark III to be used underwater up to a depth of 40 m (130 feet) – great for creative deep water photography projects. The PowerShot G1 X Mark III is packed with a range of connectivity features, such as Wi-Fi and Dynamic NFC, to easily connect with compatible smart devices through a single tap. The camera can even be woken from standby remotely through a Bluetooth®[iii]enabled smartphone, which acts as a low-powered Bluetooth®[iv] remote. Full manual control, via Wi-Fi, offers a live preview of an image on your smart device, which is perfect for monitoring and capturing wildlife, without disruption, in their natural habitat. The PowerShot G1 X Mark III will be available from November 2017 with an SRP of €1399.